I love me a big bowl of creamy macaroni and cheese! If you’ve browsed through my recipe index that’s probably pretty evident. I’ve made my three cheese stovetop macaroni at least 10 times and my broccoli and white cheddar shells about 5 times. 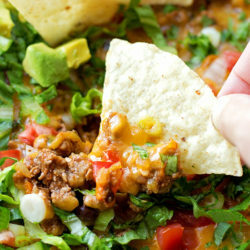 I love how flavorful and filling it is… I also love the fact that there’s always leftovers! This time instead of using broccoli, I swapped out some of the noodles for chopped cauliflower and used whole milk and reduced-fat sour cream. 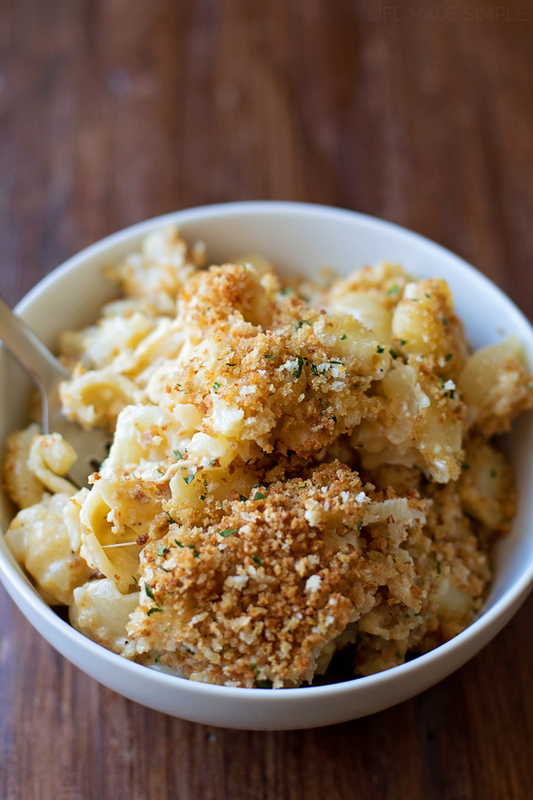 This flavorful lightened up mac and cheese is just as cozy and comforting as it’s full-fat counterpart! Gah! I just want a fork so I can dive right in! 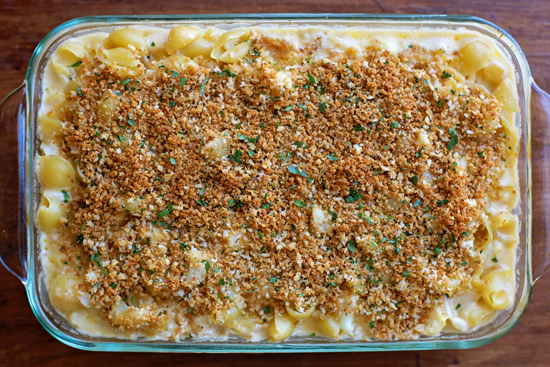 This mac and cheese is seriously soooo good! You’d never guess that it’s a “skinny” version. P.S. I didn’t dare name it that because I knew I’d get a million comments telling me how unhealthy 2 cups of cheese and half a pound of pasta is. Just know that it’s definitely a lot healthier than most recipes! So let’s talk about what goes into this recipe. 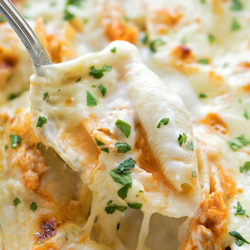 For the creamy, cheesy sauce, I used a combination of whole milk and 1/2 the fat sour cream along with minced onion, garlic and a handful of seasonings and spices. I also opted to saute my veggies in olive oil, not butter (crazy, I know, you can totally use 2 tbsp. of butter too). Instead of using a full pound of pasta, I used a half pound of whole grain shells and a full head of cauliflower cut into tiny florets. Then to top it all off I toasted whole wheat Panko bread crumbs in a bit of olive oil, seasoned them and tossed them on before putting the dish into the oven to bake. Sounds good, right?! It is, trust me! If you want to keep this recipe gluten-free, just omit the bread crumb topping and use gluten-free pasta. Those bread crumbs though, they really make the dish! 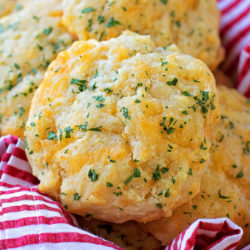 It's comfort food without the guilt! 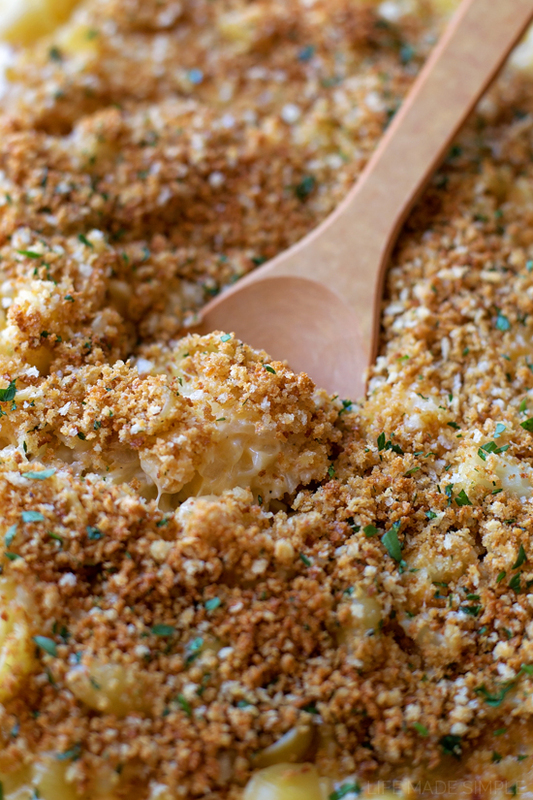 This cauliflower macaroni and cheese is light, creamy and packed full of veggies! In a large skillet set over medium high heat, add the olive oil. When the oil is hot, add the Panko and continue stirring, until lightly toasted, about 3 minutes. Stir in seasonings and parsley; set aside. In a large pot of boiling salted water, cook pasta according to package instructions. During the last 5 minutes of cooking time, add the cauliflower. Drain and set aside. Heat the remaining 2 tbsp. of olive oil in the pot. Add the onion and saute until tender, about 4 minutes, then add the garlic and cook for and additional minute or until fragrant. 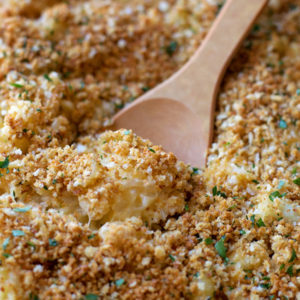 Stir in pasta, cauliflower, sour cream, milk and cheeses, a generous handful at a time. Stir until smooth, then add seasonings/spices. If the mixture is too thick, thin out with more milk. 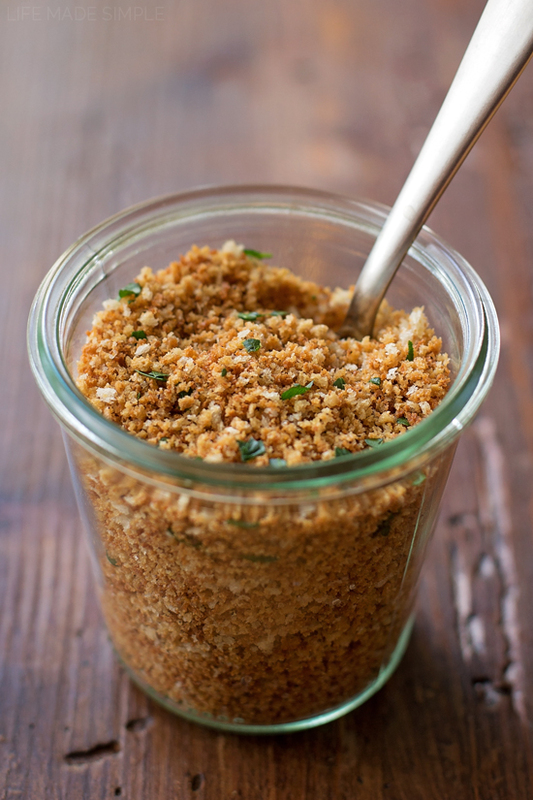 If your pot is oven-proof, you can pour the breadcrumbs over the top and place in the oven to bake. If it's not or you are serving it for a special occasion, pour it into a 9x13-inch baking dish and bake for 15 minutes or until the pasta bubbles. -You can find Panko bread crumbs in the Asian section of most grocery stores. I found mine in the baking section. oh yummy!! This looks good!